Why does Rochambeau need Fundraising? As an independent school Rochambeau is a fully self-funded non-profit school. Tuition and other sources of revenue provide a financial anchor, but do not cover the full cost of the investments we make in our students and our community each year. As a non-profit school, gifts to Rochambeau are tax deductible to the fullest extent allowed by law. Gifts made annually to support essential projects. This makes our school exceptional. These gifts help provide for the expenses that exceed the income from tuition alone. This includes investments in infrastructure and equipment of over $1 million annually. Parents, grandparents, teachers, staff, alumni and friends of Rochambeau all support the Annual Fund. Does one gift really make a difference? Every gift is important, no matter what the amount. Our goal is 100% parent and staff participation this year. Broad-based annual participation plays a major role in encouraging corporate and grant-making institutions to support Rochambeau. 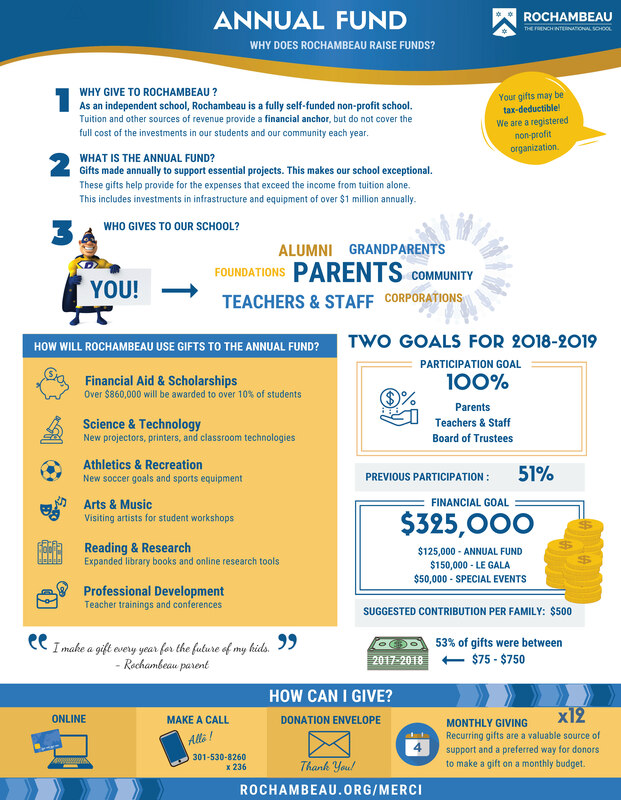 How does Rochambeau use gifts made to the Annual Fund? What are the 2018-2019 goals? (1)Parent and Staff Participation: We aim to increase parent and staff participation in giving from 51% last year to 100% in 2018-2019. (2)Financial Goal: Our goal for the Annual Fund is $125,000, with additional revenue from corporate gifts and special events of $200,000. The total goal is therefore $325,000. Last year our total fundraising was just over $262,000.